of Central. The V-12 was replaced by a huge Ford V-8. engine stayed in this truck during its entire life in NLR. It is shown above filling in for Engine 6 in late early '76. b eannexed to NLR is just a short time,, also. The city had never seen such growth! Fire apparatus, which was already old, had to be augmented in a very short time. This is the 1947 American La France that was originally Engine 3. It went to Station 5 some time after 1959. 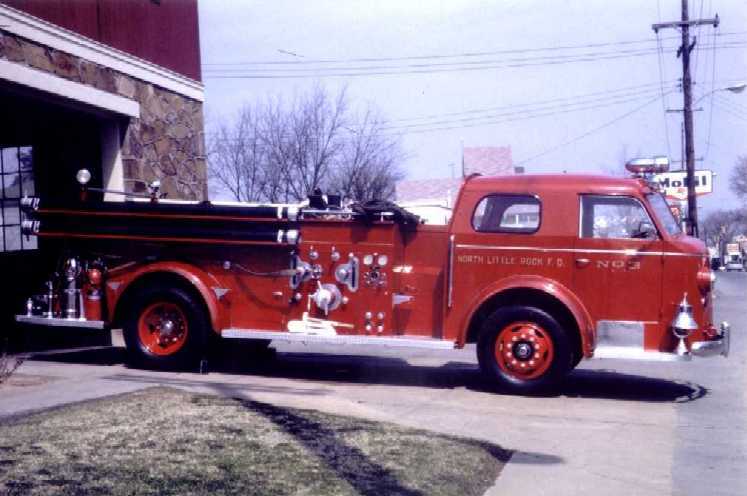 The 1959 American La France pumper swaped with this one and became "Company 3" in NLR FD language of that era. It was the "#1 Stand-by from 1971 until it was sold sometime after the delivery of the '78 Ford -Pierce. 1955, at which time it became Engine 4. It moved from Station 4 to Station 5 in 1971.
the "#1 Standby" from 1976 until 1982.